It's been a busy week with many Christmas functions to attend at work. I am looking forward to catching up with my family for a few days. I enjoyed checking out the new Opera Kitchen with the reference team at the refurbished Hastings Opera House and can recommend the fruitsalad, lemon tarts and peppermint tea. We sat outside in the main foyer with the roof open to the sun. This way we avoided the radio inside, which was too loud to speak over and could talk and enjoy the opera courtyard environment. The inside has a very contempory Hastings feel, with large tables like they've came from the freezing works. Chairs are not wide so just suit an average sized person and a very large person might prefer the option of a bench. However it is great to be in a cafe within the Opera Complex with good colour scheme and design and the food and beverages were up to standard with a good selection of fresh local produce. Christmas in the Domain, Havelock North was another true highlight, the band and singers were outstanding with good support from sponsers and the community, free sausages and softdrink. There have also been some great school breakups and prizegivings which I have attended. Te Poho, Porangahau, the land the people and their Taonga. 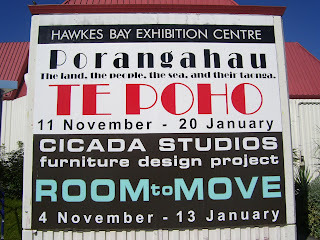 There is a very good exhibition on at the moment at the Hastings Exhibition Centre called Te Poho, Porangahau, the land the people and their Taonga. Porangahau is a rural coastal village and community in Central Hawke's Bay. It's about an hours drive south of Napier and is thirty miles from its nearest township, Waipukurau. 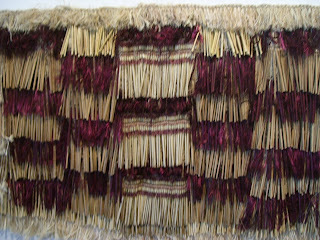 I particularly enjoyed the large wooden carvings (Takitimu canoe prow) plus the flax work, the piupiu and korowai (flax skirts worn around the waist and around the shoulders as cloaks). Photographer Sal Criscillo (www.criscillo-photo.com) has captured some wonderful photography for the images in TE POHO of local people from Porangahau (Central Hawke's Bay. In their introductory brochure/pamphlet he writes, "The images in TE POHO started almost by accident. Assisting the two writers, Hilary Pedersen and Marina Sciascia in assembling their book " Haikui, Mothers of Porangahau", the Te Poho images grew out of the preparations, research and assembly of their second book "Tuhine, Sisters of Porangahau". 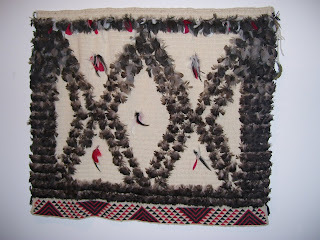 However I did notice that there were several to many men photographed as well for example white baiters in the rivers with nets , shearers at work, interestingly some fox hunters plus many people with intricate moko and tatoos, historical photos of people gathered on Marae (Te Poho derives its name from Te Poho o Kahungunu, the meeting house situated on Rongomaraeroa Marae at Porangahau), and even pictures of Peter Sharples and Tariana Turia (MPs) with folk expressing their political support of the Maori Party. Also as I recall social club rugby shields as well as a display of greenstone (Paunamu) patu and mere, gourds decorated with flax and toi toi. 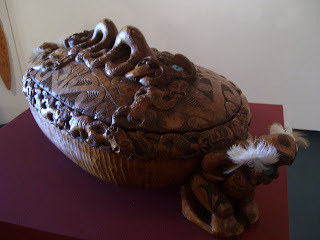 At the front door is an very intricately carved oval shaped wooden vessel for holding taonga. 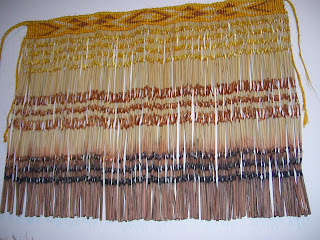 I have seen these at Marae when there is a funeral next to the body. Inside are white feathers and tea tree leaves. I am not sure how old it is but I suspect I have seen it before next to a body on a Marae! Or perhaps one just like this. 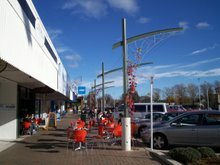 The exhibition centre is located next to the Hastings Central Library. Hope you get to see it and enjoy like I did. Of Note: The Parihaka International Peace Festival is coming up after New Year from the 11-13. Latest Comment: Hello helena, I am Marina Sciascia, we have been wanting to know how to get our exhibition out to the world and found you. So thanks, you have done it. Recommended Reading: How To Make a Piupiu by Leilani Rickard. 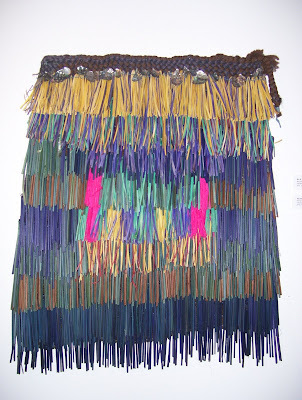 Also if you ever visit Te Papa in Wellington, there are many beautiful Piupiu to see there.